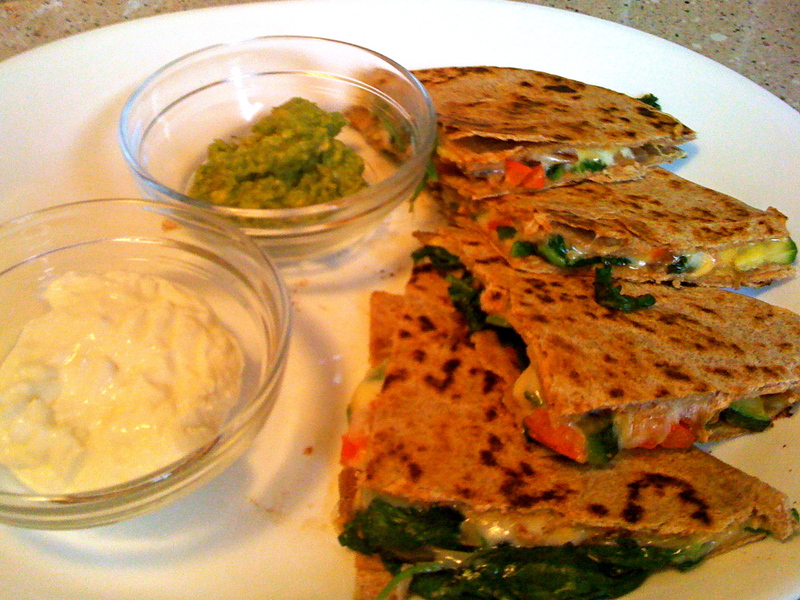 Quesadillas are my go-to meal because they are easy, fast and delicious. You can make them for yourself or for groups and I’d say they are always a crowd pleaser. But I know what you’re thinking. Aren’t quesadillas bad for you?? First off, I don’t believe that there are any good or bad foods. But it can be true: quesadillas are basically cheese, some sort of protein and high fat toppings. Luckily, like most foods they can be healthified pretty easily! I’m not going to lie and say you won’t notice the difference, but these dillas are still pretty darn good. Another way to healthify these is to use Greek Yogurt instead of Sour Cream as a topping. I grew up with sour cream (hi mom!) so they are essential to my quesadillas. Non-fat Greek yogurt tastes the same and adds a nutritious punch. 2. Spray saute pan with Pam. Cook 1/2 bag of fresh spinach until wilted, about 2-3 minutes. Nice recipe. I use 75% reduced fat cabot cheddar, which is great! Since I add so many veggies to the quesadilla, I can’t really taste the difference. It’s also just as delicious as a cold lunch the next day.